I came across false favourites lay betting by Jonathan Burgess in my mailbox on Friday and was immediately struck by the enormity of it. It’s an e-book consisting of well over 200 pages! 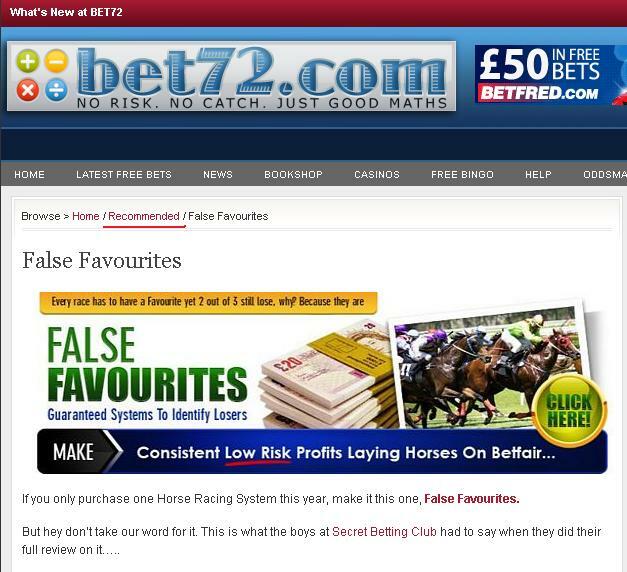 Surprisingly, hardly any of the content was the usual Betfair rubbish. It was full of sound advice on finding favourites that are likely to lose and an almost psychological approach to laying horses. The book is split into three parts; National Hunt, Flat and the all weather. A slightly different approach is required for each code. The author suggests concentrating on one code at a time, which is sound advice. Every element is written about in full detail. the aim, of course, is to find favourites that are likely to lose. A suggested maximum odds is recommended, reducing liabilities. Provides numerous examples and detailed walkthrough on how you can adopt the race specialist laying system. Excellent guide to assist and educate on how to study horse racing form. 181 pages long and superb value for money at only £39.99. The Race Specialist is the latest betting system from Jonathan Burgess, who previously produced the excellent ‘False Favourites’ e-book, which was very well received throughout the industry. Weighing in at 181 pages long, Jonathan has gladly supplied us a copy of the Race Specialist to review on your behalf. 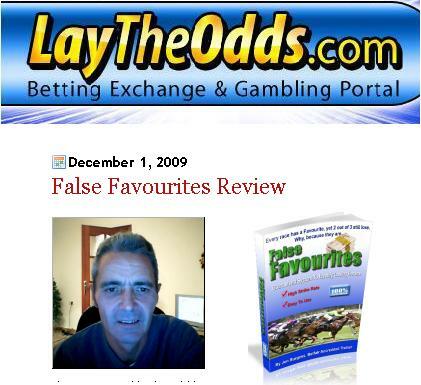 He is well qualified to write about the subject as he is a Betfair accredited trainer, with a number of articles previously published with them. Racing Systems currently have a very bad reputation so perhaps its best to start off by describing what the Race Specialist is not. It is not a mass-marketed, quickly produced system such as we see churned out by the likes of the ‘Rochdale Road gang’ on a weekly basis. It is not a system that will make you instantly rich overnight. It is not a system that takes only 5 minutes a day to follow. 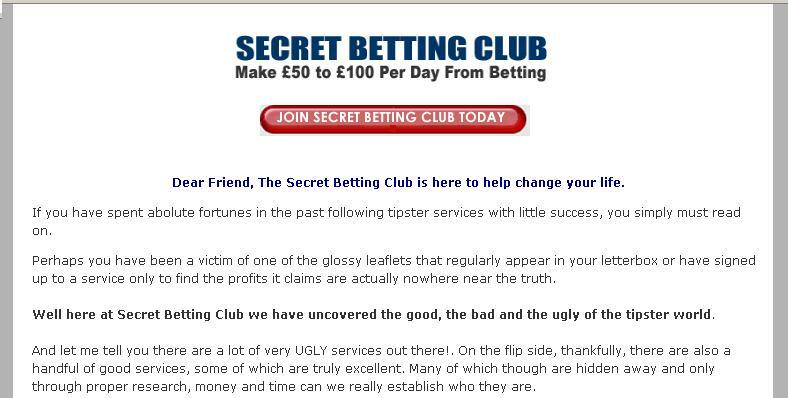 In fact Jonathan aggressively addresses all these issues throughout his eBook as he makes clear that it has been designed to offer a realistic and sensible method for helping you with your betting. In conversation with Jonathan throughout this review process, it is clear his modus operandi is to offer a genuine service at all times, with punters welfare (and ultimately their betting success) the focus of his attention. This is proven by the value for money and depth of analysis that Race Specialist goes into. Clearly this is an eBook that has taken a long time to produce and has not been knocked together overnight. 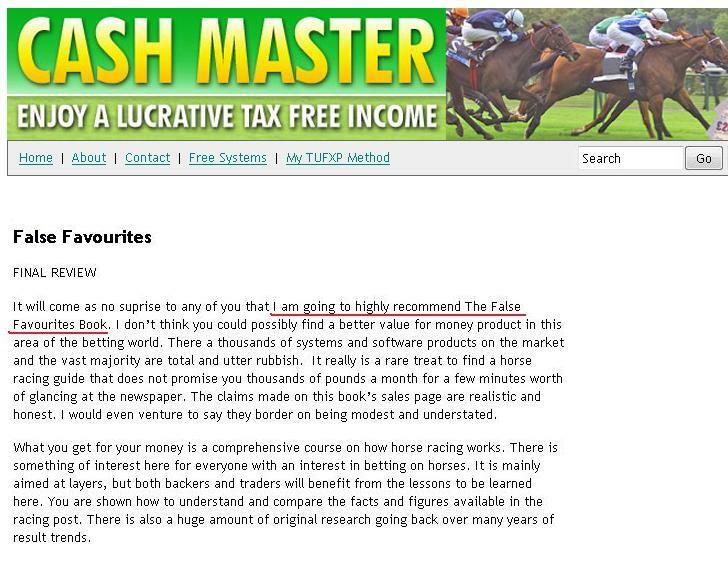 One understated way in which the Race Specialist will undoubtedly assist is to help you identify bad and ultimately unprofitable systems before you lose any money on them. If you keep getting caught out by the wrong systems, this could be money very well spent.